There are people who for one reason or another have not yet submitted their DS260. AS I have posted before, the window to safely delay your submission is closing fast. It might be the case that processing times speed up, but so far we have not seen evidence of that. We might see some increase in the next batch of 2NLs, but I wanted to send this warning now, just in case times have not reduced. IT is probably helpful to understand the current processing times. So far each month that goes by they have bundled up another months worth of DS260s. So – most forms submitted up to the end of July got 2NLs in December (assuming they were current of course). 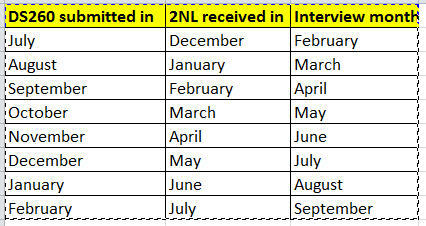 Most forms submitted in August got 2NLs in January (March interviews). In a week or so we will start to hear from people who get February 2NLs. If those people are submissions only up to the end of September it will mean there has been no increase in speed. If however we see some October submissions in there it will show there has been a small increase in speed. However, if we assume there is no increase in speed at all the table of DS260 submission date to interview date would look something like this (this is in general – there will be cases that are exceptions to this timeline). Now this table includes pretty much all submissions in a given month. By now the majority of cases will have been processed – so I don’t think a reduction in the waiting time before processing starts is unreasonable – but that is common sense talking and KCC don’t seem to work under the laws of common sense. We know that KCC haven’t even been looking at DS260s for 3 to 4 weeks up until recently. Then the last point is the complexity/speed of the DS260 processing. Not all DS260s process at exactly the same speed. A simple case of an unmarried person from a English speaking cooperative country with limited travel history is going to need less processing time than someone from somewhere such as Iran and with a spouse and 2 kids over 18. So – as I mentioned before – submitting your DS260 is a gamble. I would expect to see an increase in speed soon – at least until the May 2016 influx of work BUT I would not want to bet my own case on that gamble! Hi Simon. If DS 260 was submitted on May 19 for the 2019 DV. When are 2NLs and interview likely? Interviews will be From October 1, 2018 to September 30, 2019. 2NLs are sent 4 to 7 weeks before the appointment. Many thanks Simon. I wanted to know if early submission would help with early 2NL and Interview. For instance, 2019AF28xxx submitted DS 260 on May 20, five days after results were announced. Is interview likely by Dec 2018 because of the early submission for this case number? No. Early submission makes no difference. thanks a lot for this blog, this is so helpful. Do I understand right that you can submit DS260 for DV2019 between now and September 2019?? So if I am getting married by the end of this year, it will be fine to submit in Jan 19? I really wish to find help here. -How long will I have to wait for a respons ? -Does the case number affects the interview date? 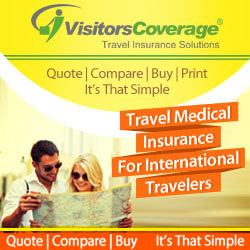 The case number determines the interview date – you will wait over 1 year. if we not submit DS260, will we get 2NL for our interview appointment or not? What should I based by advice on. Your name? Your email address? I was selected on 2nd may 2017. My cn is 2018F00049xxx. I submitted my ds260 on 28th June 2017 but I have not received the 2nd notification letter. Is this mean I was ignored and unlucky to go further to the interview? because I heard that all cases left have been released. No it does not mean that. They will be scheduling cases for another few weeks. i was selected in DV2019 on 15 may i filled my DS-260 at 30 jun and my husband filled his on the 14 of July, my case number is 2019AF00027xxx my questions are? 1- When are we going to get are 2NL for interview? 2- which one of the completed DS-260 counts as i was the one who was selected and my husband is the accompany me? 2. They both “count”. What do you mean? What is the last month for filling ds260 form for 2019 should I fill up and of September? People will still be submitting DV2019 DS260s well into next year. Tell the truth in the form. No it should not affect you. Thanks very much for this blog . Very helpful. Am trying to enter my KCC number and passport number to electronically sign in my application but it has refused to work. In order to get help – you have to be clear about what you are doing. Hi, Simon. I submitted my DS260 form on the 1st of August. My case number is 2019EU7XXX. As I understand my number is relatively low, does that mean that my interview is likely to be postponed because of DS form processing times? Im an applicant from Burundi (Africa). I entered the lottery in 2016. I filled my ds260 form in September 2018 close to the deadline day. My question is if I still have a chance to be scheduled for interview? Do you mean a DV2018 case? If so, DV2018 is closed, there is no way to process a DV2018 case.